How to get in shape for volleyball! Because the pattern of volleyball movements is so unpredictable, it saps more of your body energy when you move. So you can’t afford to waste additional energy with inefficient movement patterns. It is critical that you move efficiently, especially through your hips, torso, and shoulders, also known as your “Pillar”. Exercises like the plank, plank with arm movement and gluteal bridge marching will help solidify this area and prepare your torso for the intense, rotational demands of volleyball. In addition to developing leg strength and power, building a solid foundation of pillar strength will give you a platform to leap higher, swing harder and cover the court faster. 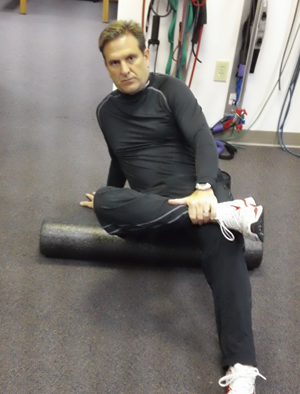 Foam rolling technique uses deep compression to help roll out muscle adhesions, over time. Think of your muscle as a shoelace. It has a certain length to it. If you pull on both ends of the shoestring, the knot will become tighter. You need to work the knot out and restore the original length of the shoelace. The same goes for your muscles. By working out those knots in the muscle, which often are due to repetitive activity, you will be able to restore the muscle to its original length and function. 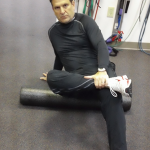 This technique is very efficient and should coincide with your daily stretching activities.